The leaders of Afghanistan and India have signed a strategic partnership agreement during a visit by President Hamid Karzai to Delhi. Mr Karzai met Indian PM Manmohan Singh, who said violence in Afghanistan was undermining security in South Asia. He also said that India would "stand by Afghanistan" when foreign troops withdraw from the country in 2014. 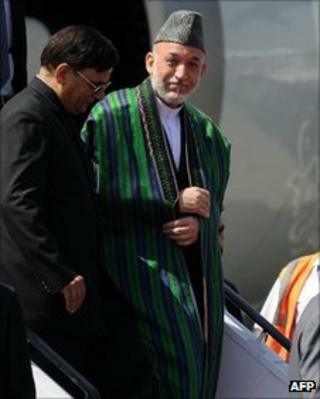 Mr Karzai's visit follows a series of attacks which have damaged ties between Kabul and India's rival, Pakistan. Correspondents say the increasingly close relationship between Kabul and Delhi will be viewed with some suspicion by Pakistan, which sees Afghanistan as its backyard. At a press conference in Delhi, Mr Singh said that the strategic partnership between the two countries will create an "institutional framework" so that India can help in Afghan "capacity building" in the areas of education, development and people-to-people contacts. The pact is believed to include an Indian commitment to increase its training of Afghan security forces, including the police, although Mr Singh made no reference to that in his press conference remarks. The prime minister said that the two countries had also signed two agreements relating to Afghanistan's energy requirements which represented "a new dimension in economic relations" to enable Kabul to integrate more effectively with the Indian economy and other economies in South Asia. He said that the people of India sympathised with Afghanistan as it sought to cope with "acts of terrorism... particularly the assassination of [peace envoy] Burhanuddin Rabbani". "Rabbani was our guest in India in July and we were greatly encouraged by his vision," Mr Singh said. "His brutal assassination should... strengthen our resolve to jointly confront the menace of terrorism." President Karzai said that he was "grateful" for India's help as his country strives to overcome "violence and extremist activities". In his statement, Mr Karzai reiterated that his government would work closely with the US, Europe and India to plan Afghanistan's future. The BBC's Sanjoy Majumder says that Delhi is concerned about the security situation in both Afghanistan and Pakistan, especially as foreign troops begin to withdraw from the region. India is one of Afghanistan's biggest donors, having pledged money for projects ranging from road construction to the building of the Afghan parliament - and is keen to play a bigger role. Delhi has often accused Islamabad of links to groups such as Lashkar-e-Taiba and the Haqqani network that have carried out attacks in Afghanistan on Indian targets, including an assault on the Indian embassy in Kabul in July 2008, in which 40 people were killed.